Kevin Morton Jr. planned on working in the pharmaceutical industry, but a near-death experience in 2007 changed his life. This story could've ended tragically years ago. In 2007, then-22-year-old Kevin Morton Jr. had just finished working the night shift at a Detroit Arby's. The Oakland University student was heading to his car when a man emerged out of the shadows and attempted to rob Morton. The robber fired a shot that hit Morton in the abdomen. When Morton arrived at the hospital, doctors believed he had a 10 percent chance of making it through the night. "Whether we call it intuition, experience or a miracle … we put some extra sutures in and the bleeding stopped," Dr. Dharti Sheth-Zelmanski, who was working the trauma unit at Detroit's St. John Hospital the night Morton arrived, told NBC News. Before the shooting, Morton planned on going into the pharmaceutical industry. But after 50 days recovering in the hospital and witnessing the compassion of doctors who helped save his life, Morton changed his plans. 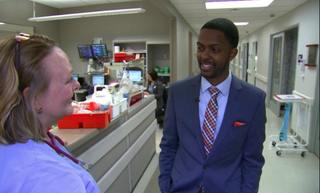 Nine years after being shot, Morton graduated earlier this month from Michigan State University’s College of Osteopathic Medicine. He is set to start his residency at the same hospital where, nine years ago, he was given about a 10 percent chance of making it through the night. "The compassion and drive that Dr. Sheth has shown in trying to save my life … I just wanna pay that forward," Morton told NBC News. Sheth-Zelmanski told the news station that his patient-turned-protégé has come a long way. "We knew he wasn't going to give up," Sheth-Zelmanski said. "We weren't gonna give up — so we had to make it happen."